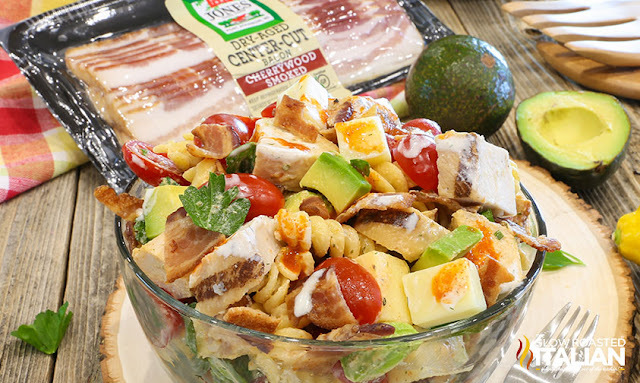 This easy pasta salad recipe really takes your favorite bacon avocado club and transforms it into this extraordinary fully loaded pasta salad that will knock your socks off! We are so excited to be partnering with our friends at Jones Dairy Farm to bring you the ultimate pasta salad! 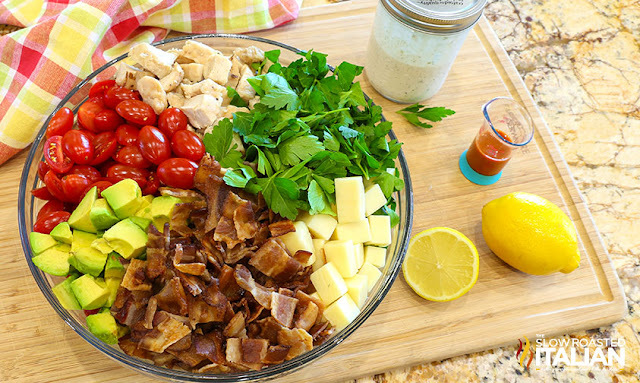 Its is amazing picnic food and perfect for everyday, starring one of my favorite ingredients: Dry Aged Cherrywood Smoked Bacon!!! Jones Dairy Farm bacon is absolutely amazing! They smoke fresh pork bellies with real cherrywood chips which results in a slightly sweeter bacon. you know you are getting great quality and incredible flavor. How do you make easy pasta salad recipes? 1st - PASTA. Start by selecting the perfect pasta. We love cheese tortellini in pasta salads. It adds another dimension to the pasta salad. But, medium size pasta with lots of ridges that catch the dressing are also perfect, like rotini, cavatappi and ridged elbows. 2nd - PROTEIN. Choose your protein(s). We have tried many different options in our pasta salads. There are so many options: chicken, shrimp, cold cuts, beef, pork, eggs and so many more ideas. 3rd - VEGGIES. Pick vegetables that compliment your pasta salad. I like to choose vegetables that add a colorful element to the salad as well. 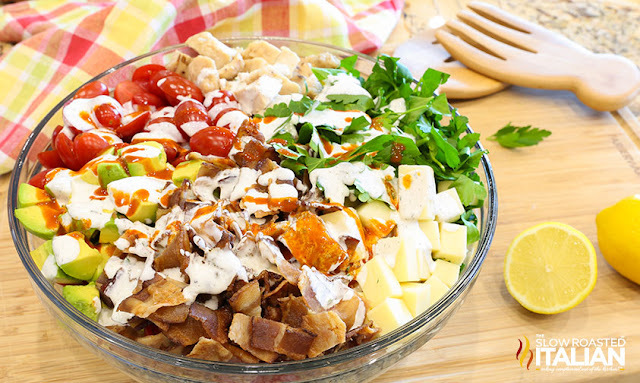 For example I use orange bell peppers to make salads more visually appealing. 4th - CHEESE. Whether or not to add cheese is a personal decision, but for my creations "if" I add cheese is never a consideration. It is only what type goes with the salad. I think cheese is a requirement in just about every pasta salad. Although there are a few exceptions. 5th - FLAVOR. Look for the pop of flavor. Add pepperoncinis, jalapenos, roasted red peppers, olives, onions, pickles, hot sauce, citrus, there are so many options. Of course my favorite: BACON. 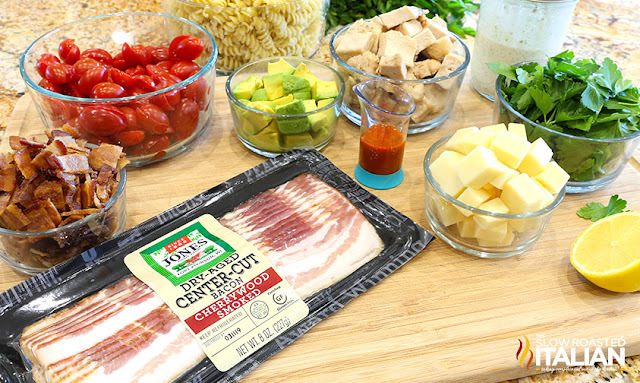 It is really the perfect addition, especially Jones' Dry Aged Cherrywood Smoked Bacon that adds an unexpected flavor boost to your pasta salad. 6th - DRESSING. There are so many options, you can use your favorite coordinating store bought dressing or put your own together. Pasta salad can be the perfect side dish for so many recipes. But when it is made right, it is an all in one meal. 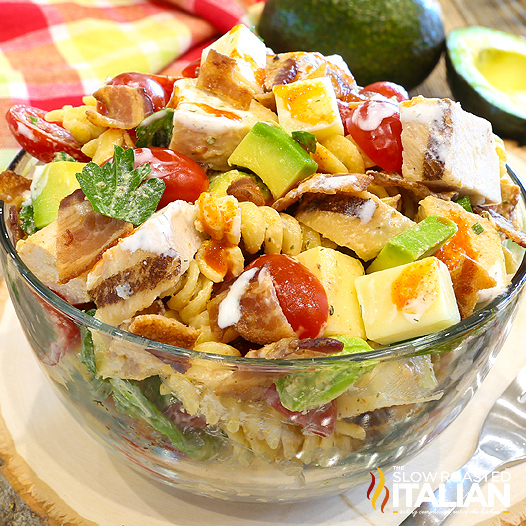 Take for example this Avocado Club Pasta Salad that is loaded with bacon, chicken, cheese, avocado, tomatoes and fresh parsley. It is the ultimate satisfying all in one meal! Do you prefer to enjoy it as a part of a picnic or barbecue? How about adding some oven roasted corn on the cob, fruit salad, and sliders and sandwiches! How long does pasta salad stay good for? Pasta salad with mayonnaise will last for 3-5 days in the refrigerator. It is best served the day after it is prepared and should not be left at room temperature more than 2 hours. When you are making a cold pasta salad it is important to drain and rinse the pasta in warm water. Rinsing the pasta stops the cooking process and also washes off the stach from the pasta and that results in a creamier pasta salad dressing that will not get gummy. When you are preparing a hot pasta dish it is not important to rinse the pasta as the starch will help your sauce come together. I will let you all know that you can pick up Jones Dairy Farm products at your local retailer. The company’s products are distributed nationwide, so be sure to check out their product locator so see where you can pick some up. If you are sensitive to spicy food, you can make the ranchito sauce without the hot sauce and it is an amazing herbed buttermilk ranch dressing. Choose a hot sauce that you enjoy the flavor of. To halve tomatoes: Grab two lids of the same size. You can use plasticware or lids from your fridge. Place one lid with the lip facing up, so you have an edge that will hold your food. Fill the lid with grape tomatoes. Place the second lid on top of the tomatoes with the lip facing down. Firmly press down on the top lid. The two lips will hold the tomatoes in place, so they do not roll off the lid. Slide your serrated knife between the lids and carefully slice through the tomatoes. Watch your fingers. Now you have halved tomatoes in the blink of an eye! 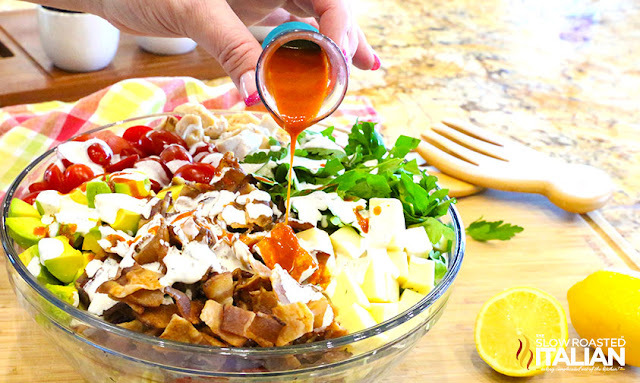 Salsa Picante Hot Sauce - Hot sauce with a great flavor to it is perfect for this salad. 3-in-1 Avocado Tool - The gadget everyone needs in their kitchen. It cuts, pits and slices your avocados. Safely. Cutting Board- A big good solid cutting board so you can prep all your veggies on one surface. I use my cutting board daily so it’s worth the investment. Quality Knives- Quality knives make prep time much quicker and are important for safety as well. If you make one kitchen investment, I believe it should be in quality knives. 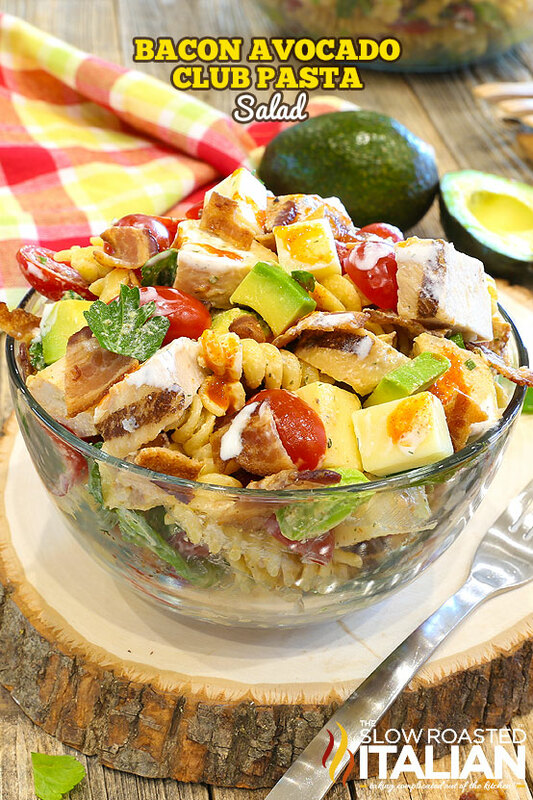 This easy pasta salad recipe really takes your favorite bacon avocado club and transforms it into this amazing fully loaded pasta salad that will knock your socks off! Lay slices of bacon on a foil-lined baking pan. Place the pan in your cold oven. Turn the heat to 400°F and bake for 12 to 20 minutes. The length of time will vary based on the thickness of your bacon (thick-cut takes longer) and the doneness you prefer (I like mine crispy). Chop up the cooked bacon and set aide. Meanwhile: Pour 2 tablespoons of lemon juice in a 1 cup measuring cup or a small mixing bowl. Pour milk over top. Set aside. The milk will thicken and curdle, making a scrumptious homemade buttermilk for our dressing. Meanwhile: Combine mayonnaise, sour cream, dried herbs and spices in a 16 ounce or larger canning jar. Whisk until well combined. Add homemade buttermilk and 1 tablespoon hot sauce, seal jar and shake the living tar out of it until well combined. Taste for flavor and heat. Add more hot sauce as desired. Chill until ready to use. 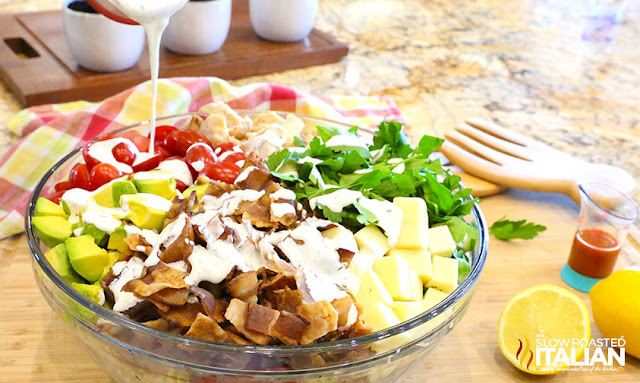 This can be made ahead and let to sit in the fridge until you are ready to make the pasta salad. It keeps for at least a week in the fridge. Bring a large pot of salted water to a boil. Cook pasta according to directions on the package. Make sure the pasta is cooked through and past the al dente stage. Remember your pasta will firm up when it is chilled. Drain and rinse pasta in water. Rinsing the pasta stops the cooking process and also washes off the starch from the pasta and that results in a creamier pasta salad dressing that will not get gummy. Combine pasta and 1/2 of salad dressing in a large serving bowl. Toss to combine. Add remaining salad ingredients, the remaining dressing, and the lemon juice. Gently fold salad ingredients together. Refrigerate until ready to serve. Copyright ©2019 The Slow Roasted Italian – All rights reserved.